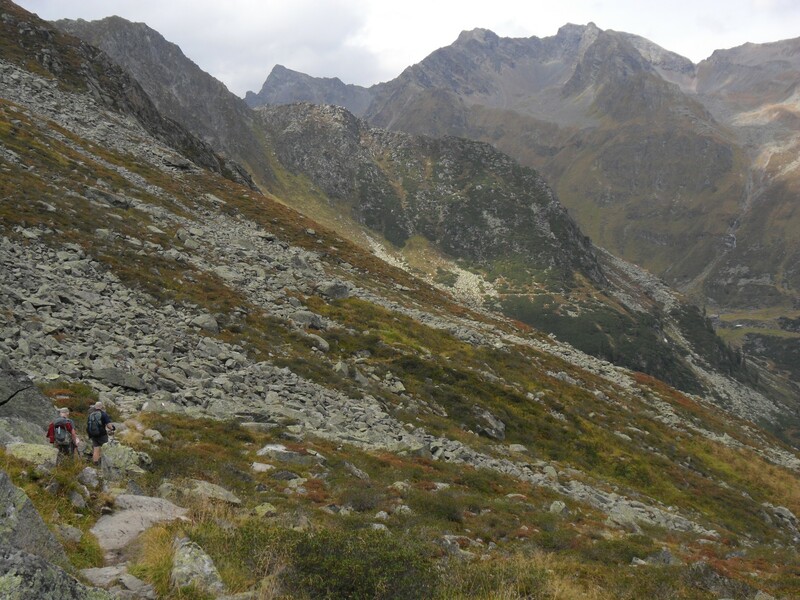 Category Archives: Stubai Rucksac Route. Stubaier Höhenweg XII – Postscript. 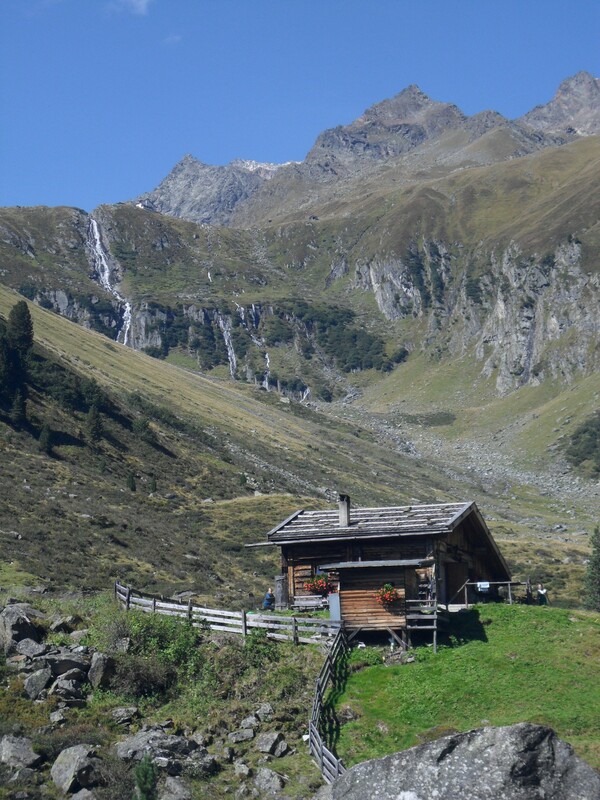 If you have read my last few posts about the ‘Stubai Rucksack Route’ [Stubaier Höhenweg] you will realise how enjoyable hut to hut walking in Austria is. 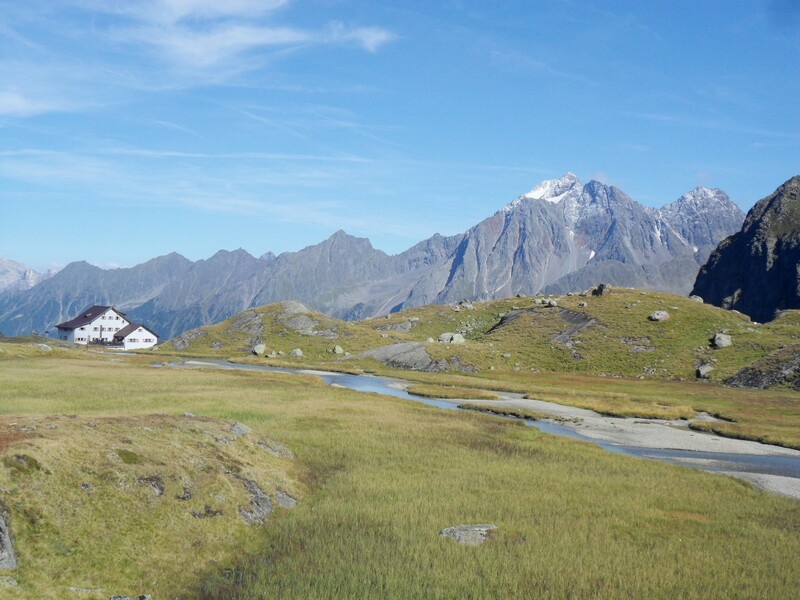 The area is so walker friendly – ease of access, good maps, signed and waymarked paths, superb alpine scenery, excellent friendly huts providing good food and drink, English spoken everywhere …… I have no reason to doubt that the other Austrian Alpine areas are as good, I will try somewhere different next year. There are many suitable guide books available Cicerone and Rother for starters. Just give it a try. In my first post regarding preparations I discussed the problems my feet were causing. I’d gone out and bought a new pair of Hi-Tech Eurotrek boots, cheap and light. These proved comfortable from the first day and I had no further blister problems. 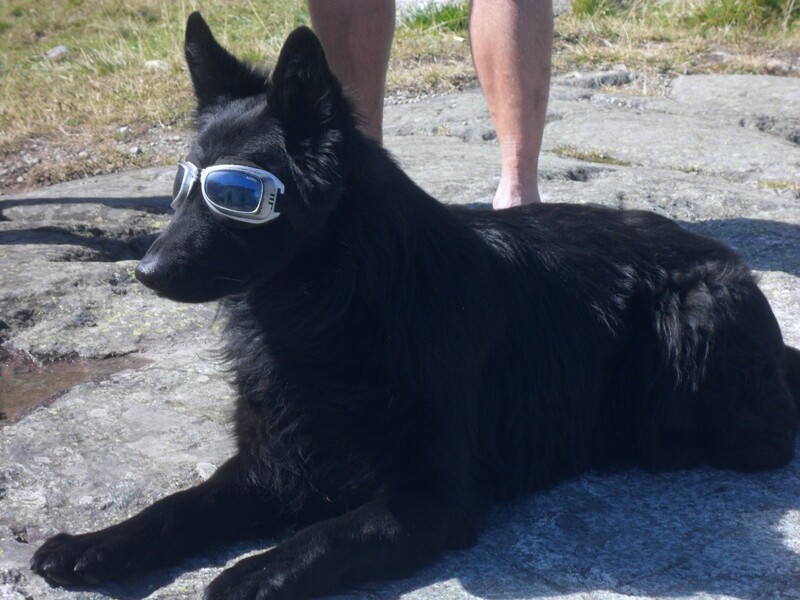 They were more than adequate for the rough terrain and seemed waterproof. At the end of 10 days walking there was minimal sign of wear on the treads, though with previous pairs I’ve found this is their weak-point. My other purchase was a cheap light Peter Storm waterproof jacket. We only had one afternoon of rain in the whole trip and the jacket was only worn then. It proved to be totally waterproof but suffered from mild breathability problems that I can live with. So £20 well spent though again I wonder about longer term durability. I will provide an update on both boots and jacket in three months. Now back home after an excellent night in Innsbruck – recommend The Golden Krone Hotel and the the nearby Steiglbrau restaurant. Despite the palpable influx of immigrants into Austria and Germany our return rail travel went well, with time for a meal in Munich before a smooth Easyjet flight to Manchester. The evenings have become noticeably darker and the dry weather distinctly Autumnal. Where to next? The sky is clear tonight with a large bright moon shining into my bedroom. Setting the alarm for 3am to hopefully view the moon’s eclipse. 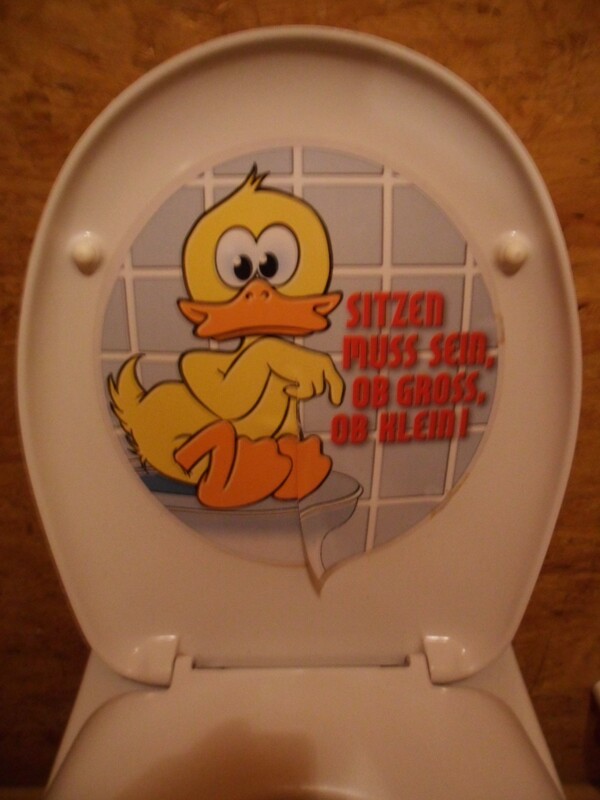 PPS When in the Austrian Huts don’t forget — — or male or female. 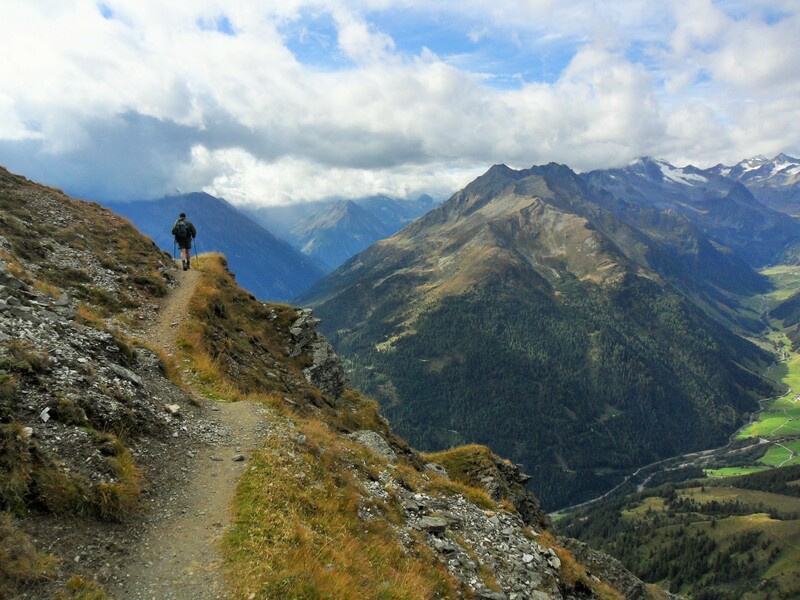 This entry was posted in Long Distance Walks., Stubai Rucksac Route., Walking. 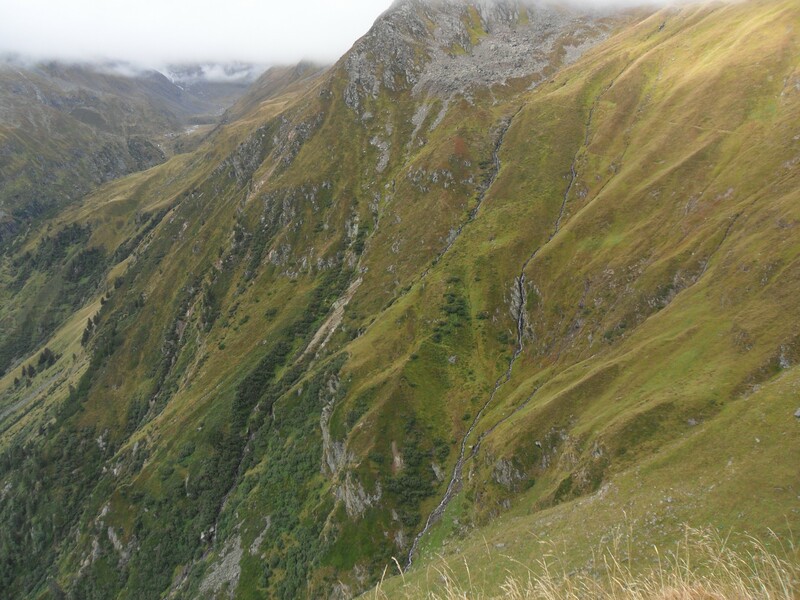 and tagged Austria, Long Distance Walks, Stubai, Walking. on September 27, 2015 by bowlandclimber. Stubaier Höhenweg XI – a fitting finale. Adolf-Pichler – Starkenburger Hut – Fulpmes. An early start for what would be a long day if we wanted to get out of the mountains today. This was helped by the breakfast being only a few slices of bread with cheese – no need to linger. 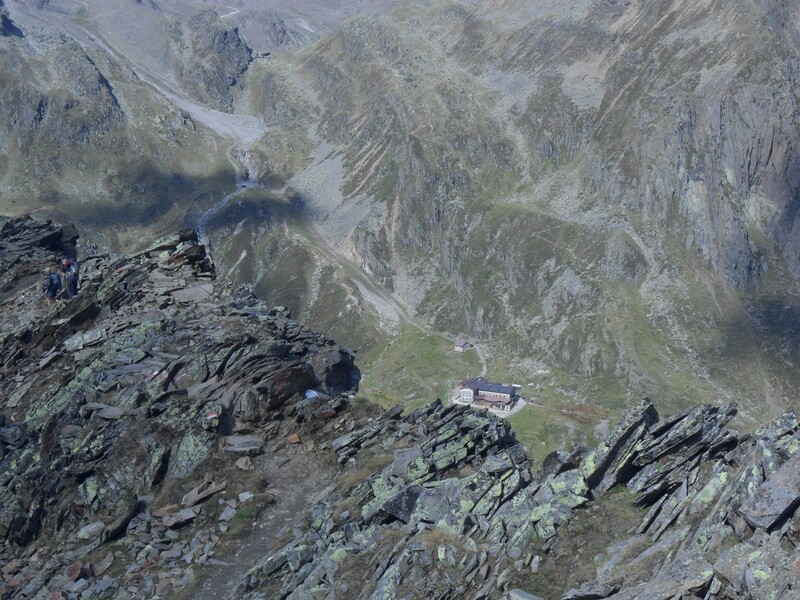 The route up to the Seejochl 600m above was obvious from the hut door and didn’t take us too long. The sun was just coming over the limestone pinnacles as we reached it and a herd of chamois grazed across the scree slopes. There were great views back to the A-P hut and beyond. We passed under some impressive limestone buttresses. 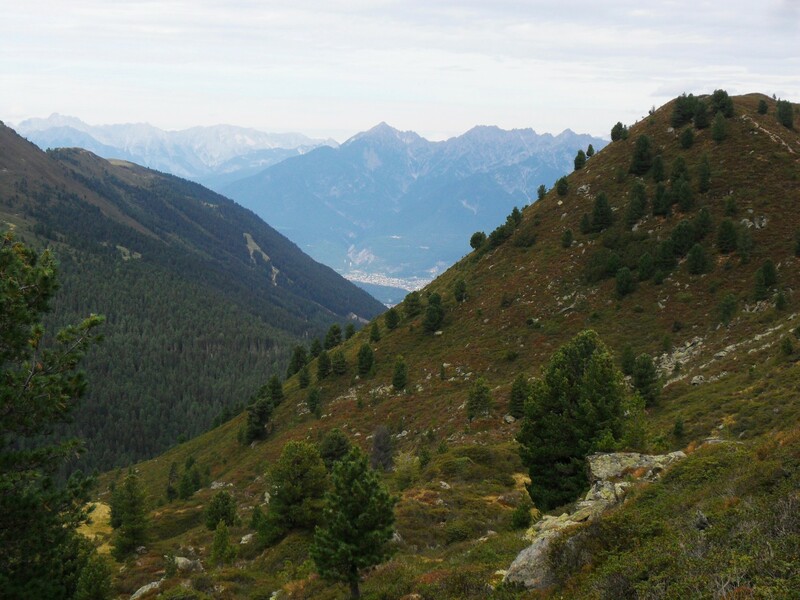 Looking back to the A-P hut, Innsbruck and beyond. 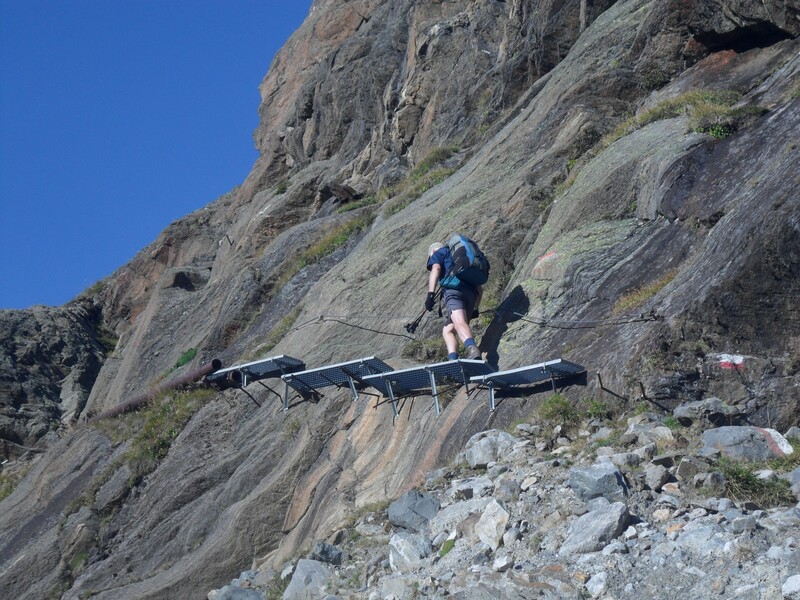 … or a more leisurely descent to Fulpmes. The latter won out and we enjoyed the easy if longer way for two reasons. 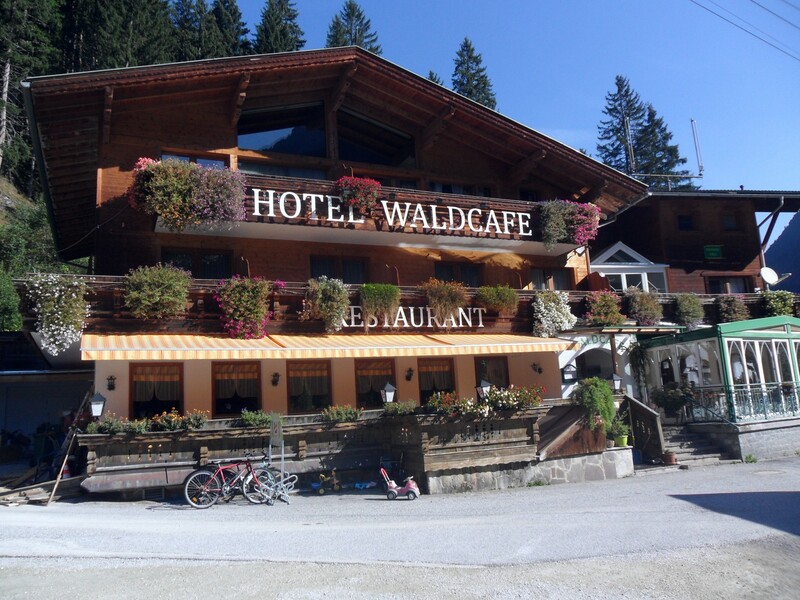 One – we arrived at Galtalm just in time for lunch and enjoyed a perfect rosti with eggs and a beer sat in the sunshine on their terrace with views to match and Two – not much further on we came across a working ski lift which had us down into the valley in no time. 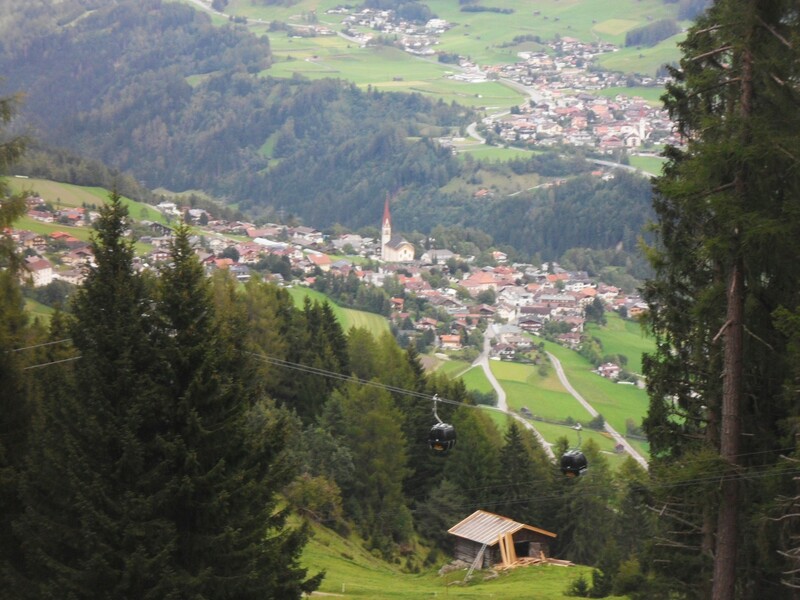 Fulpmes was a typical ski resort but we didn’t have to wait long for a bus into Innsbruck. What service. 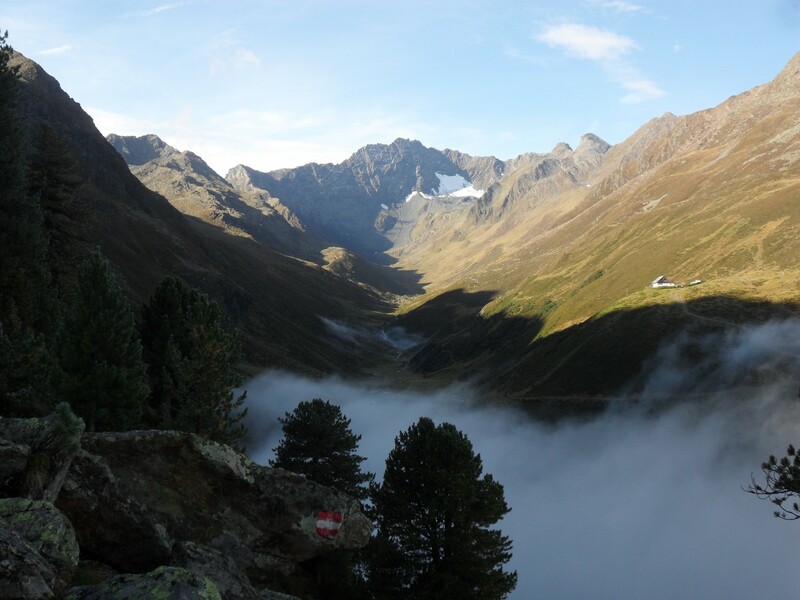 This entry was posted in Long Distance Walks., Stubai Rucksac Route., Walking. 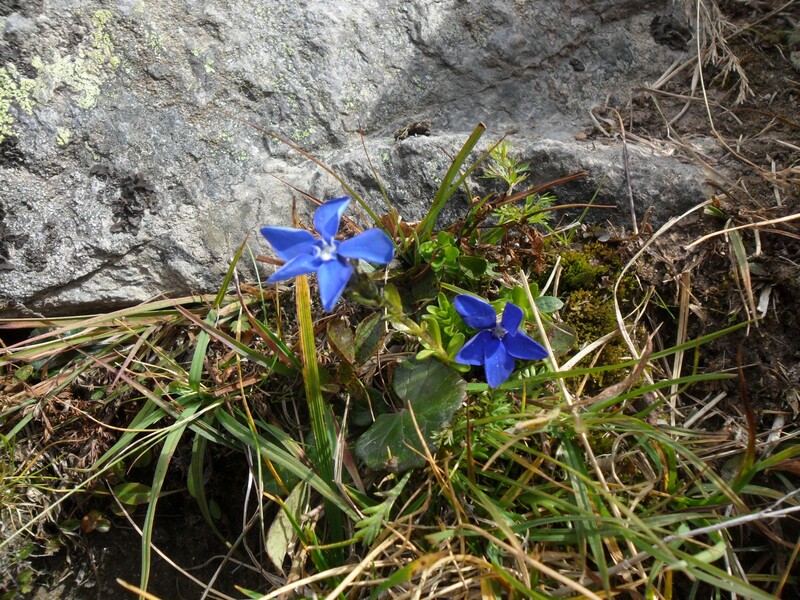 and tagged Austria, Flora and Fauna, Long Distance Walks, Stubai, Walking. on September 25, 2015 by bowlandclimber. Stubaier Höhenweg X – Adolf who? 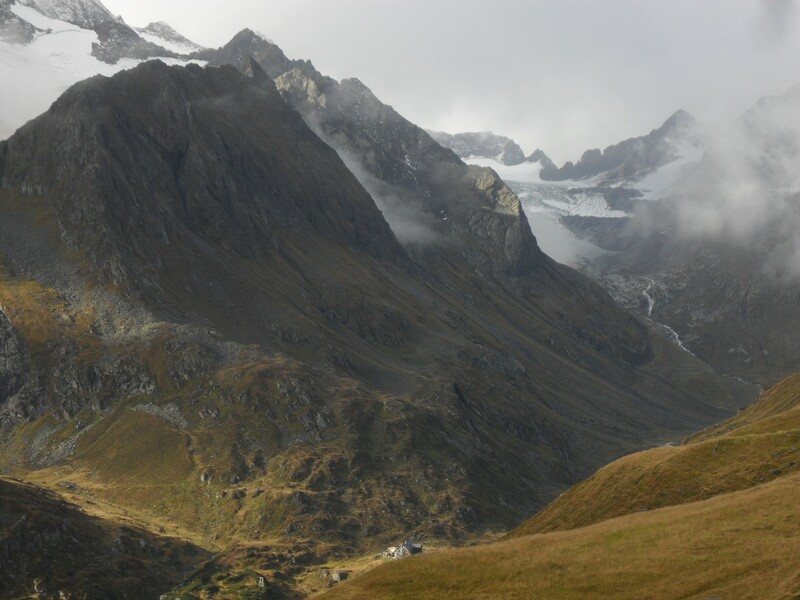 Mist in the valley below the Potsdamer Hut. Had to remind the pieman to go careful with the war jokes. 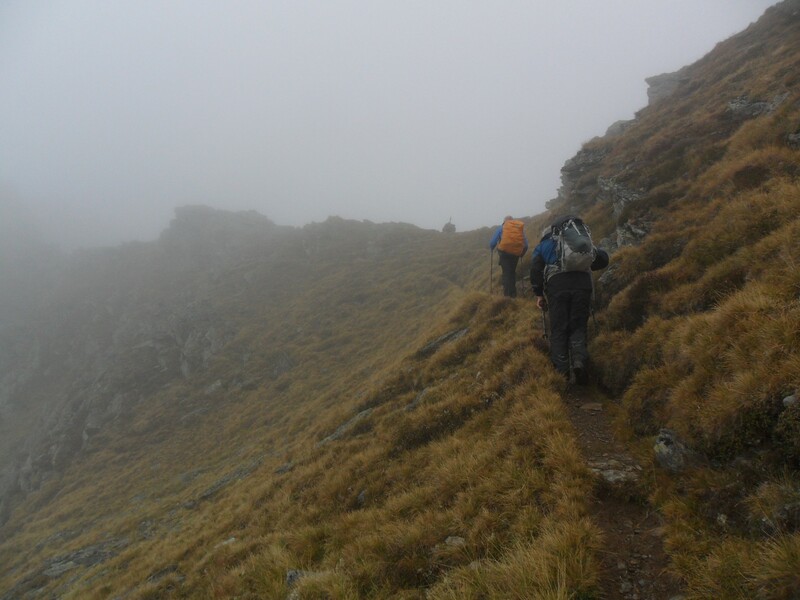 Our plans to scale the Schwarzhorn en-route to the Starkenburger Hut were dampened, literally, by low cloud. 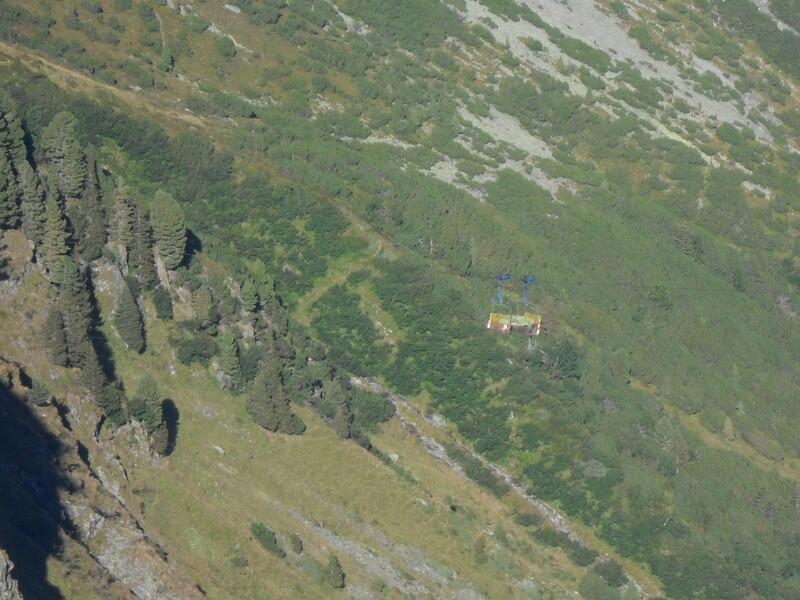 The hut warden suggested going to the Adolf-Pichler hut instead with the option to continue to the Starkenburger. 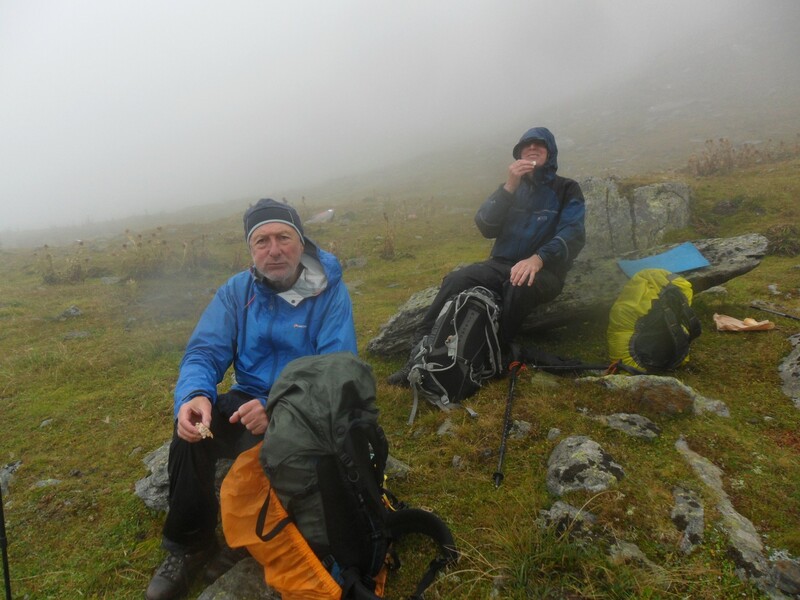 We clung to a hillside in the mist and worked our way up to a col which seemed to give easy access to the A-P. If we had studied the map more carefully we would have noticed the scale of the area and the size of the intervening valley. We imagined various routes through the hills that didn’t really exist, just be content and follow your red and white waymarks. There is no such thing as a short day here. You have left the big mountains behind and this region borders onto the limestone. 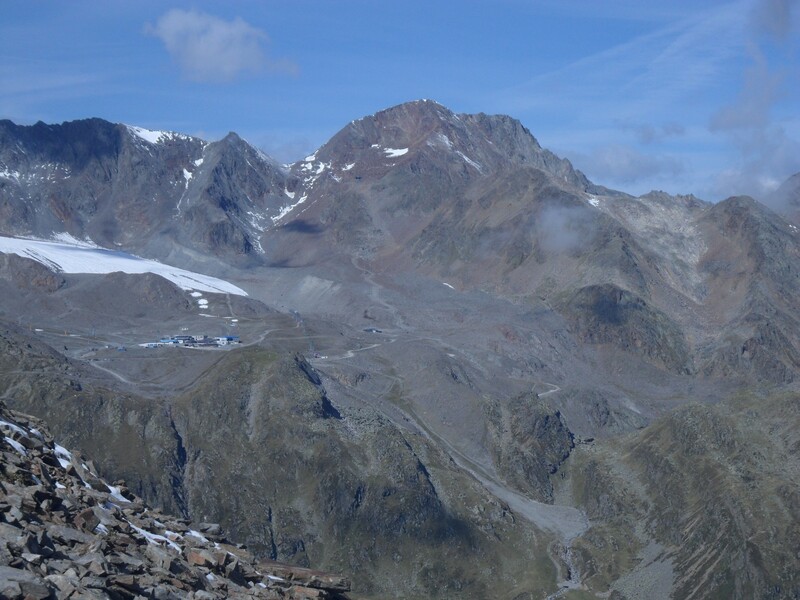 We had great views of the ‘dolomitic’ Kalkkögel range. After losing all our height we were cheered by the lovely path heading up again – a true balcony path amongst rocks and low trees with strange bits of steps. There were views down to Innsbruck now much closer. 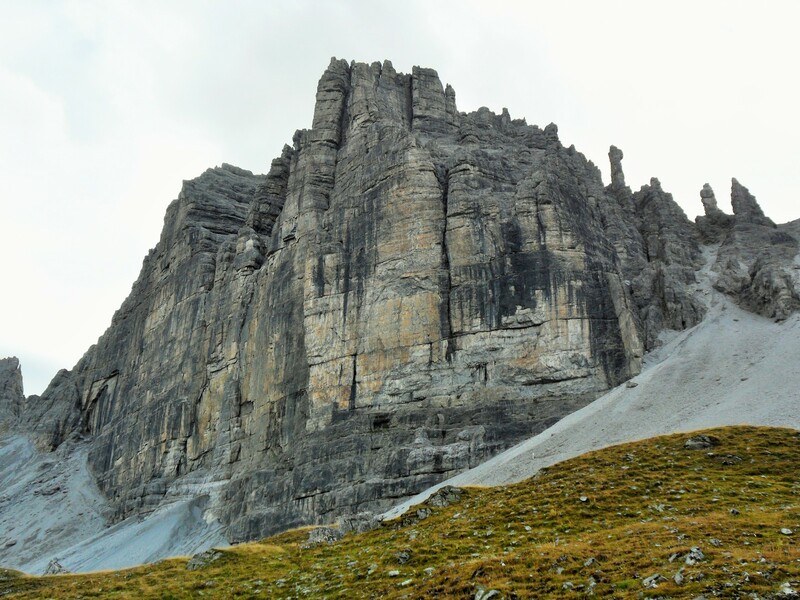 At the next col the A-P hut appeared tucked away below the limestone cliffs and was soon reached. 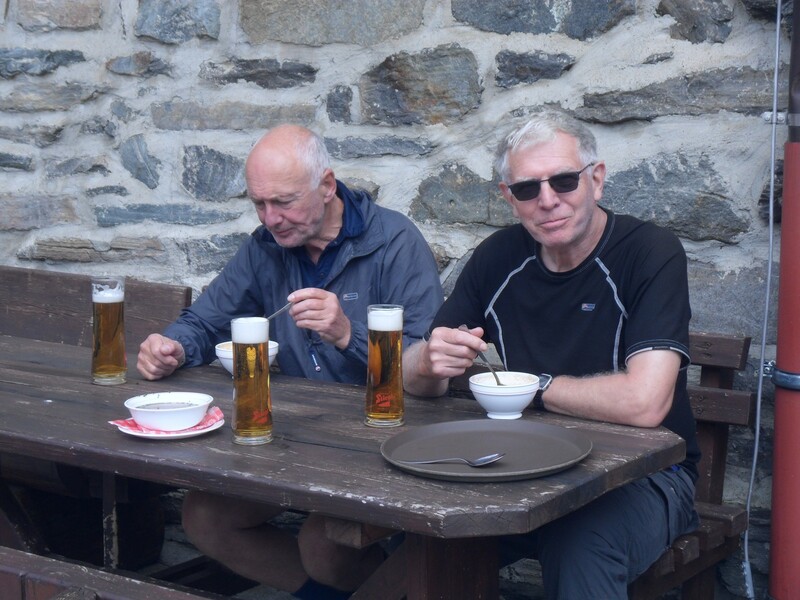 Despite our early arrival thoughts of continuing evaporated as instead we tucked into cheese dumpling soup and chatted to the friendly young staff. The dining room was warm and welcoming with its ceramic stove, the Kachelofen, and a good library to while away the afternoon. 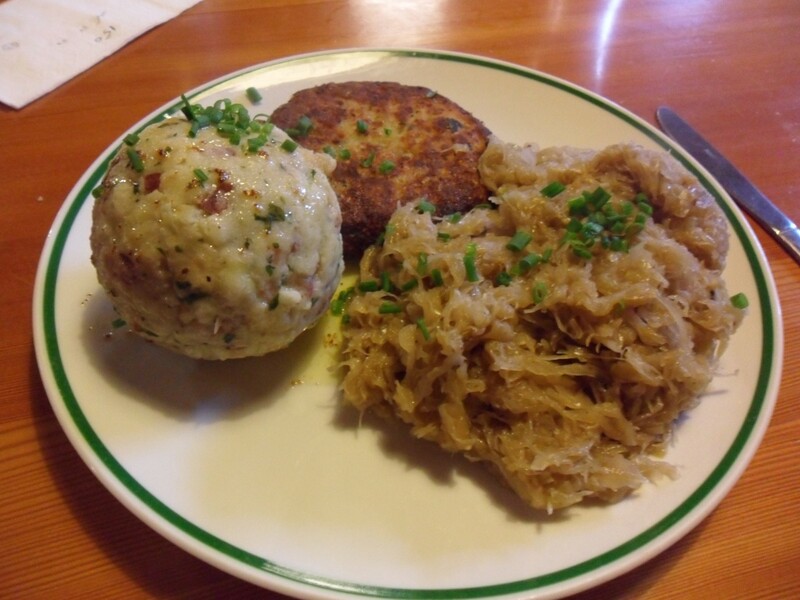 We failed that evening to finish the bergsteigeressen of dumplings – may not want to see another for some time. 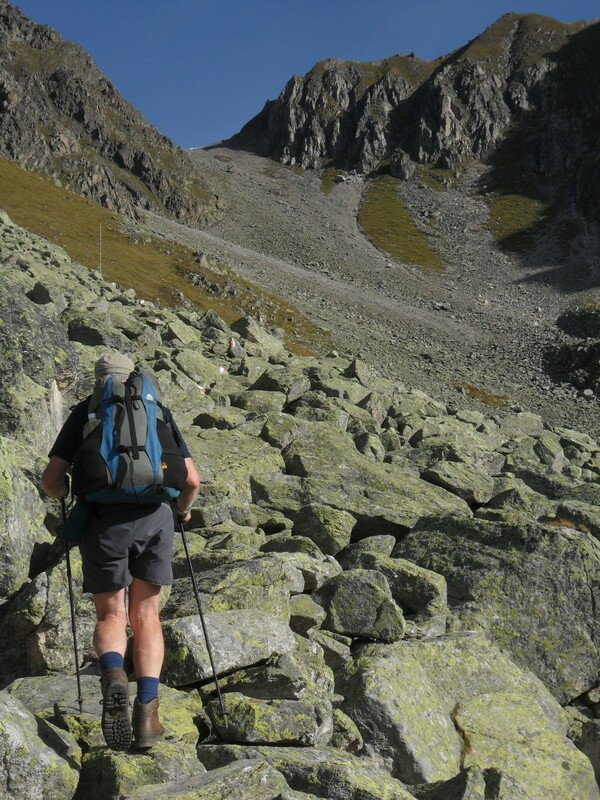 This entry was posted in Long Distance Walks., Stubai Rucksac Route., Walking. 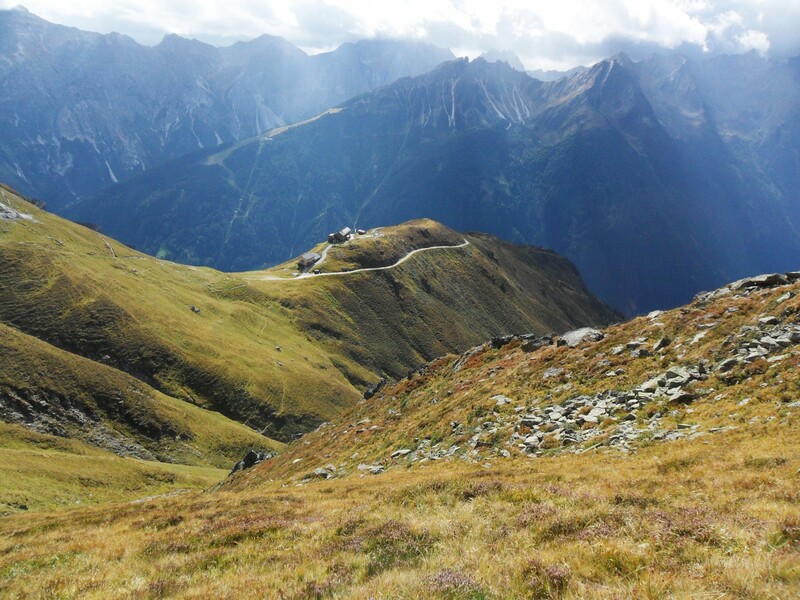 and tagged Austria, Long Distance Walks, Stubai, Walking. on September 25, 2015 by bowlandclimber. 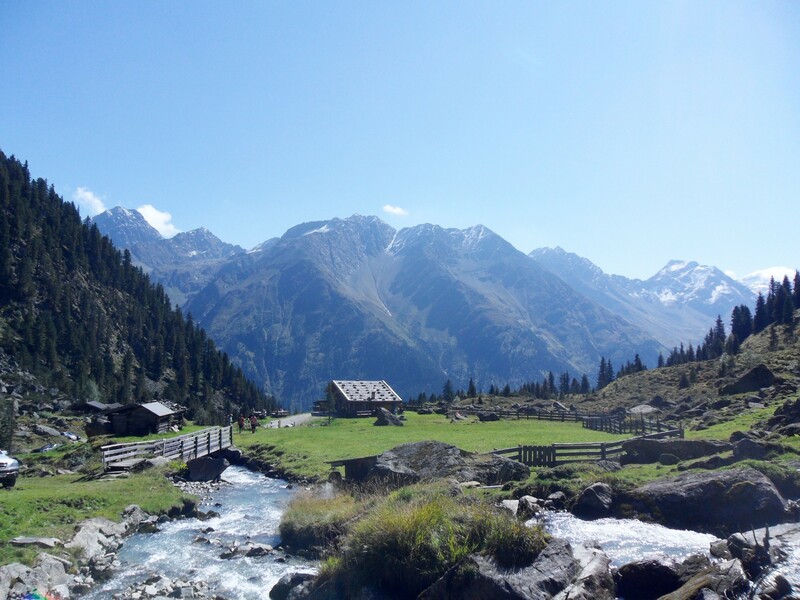 Stubaier Höhenweg IX – a pleasant diversion. Franz Senn – Potsdamer Hut. Leaving the Franz Senn behind. 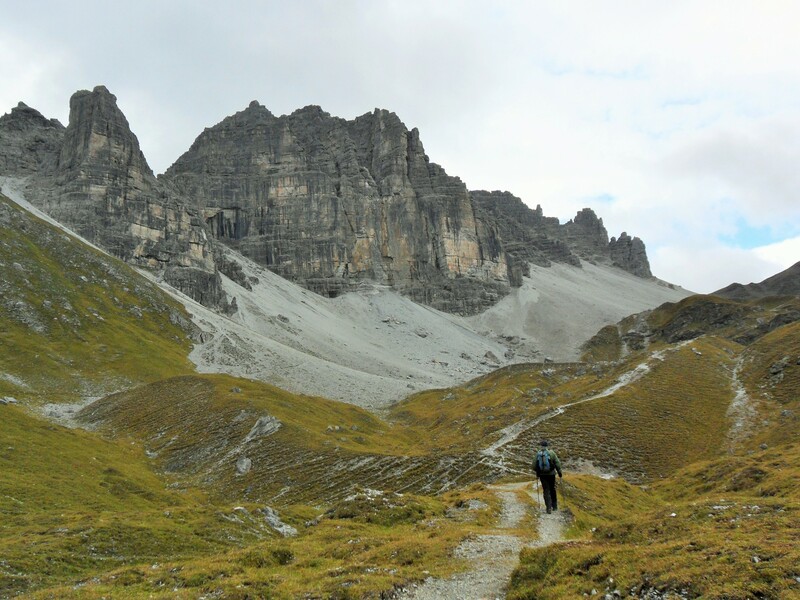 We had a day to spare in the mountains so rather than go straight to the Starkenburger Hut we planned an extra night en route at the Potsdamer north of the Wildkopf. There were plenty of choices. 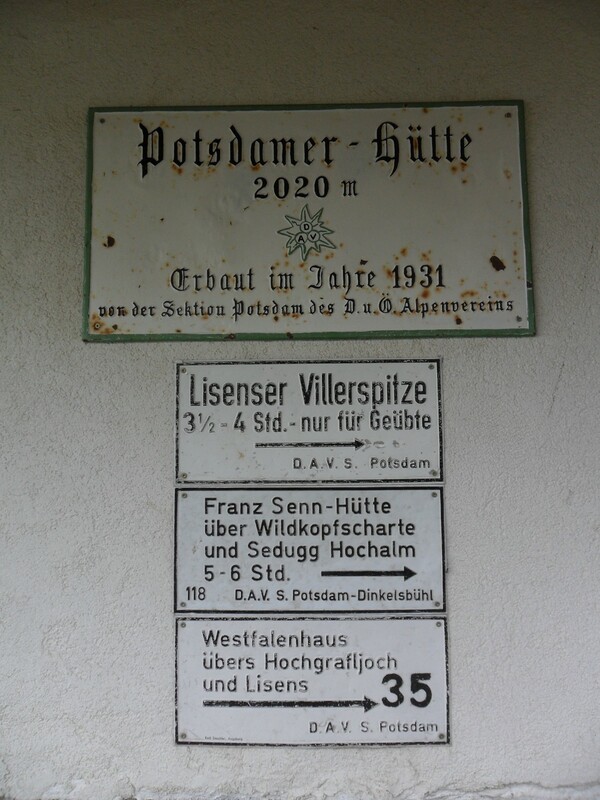 The morning was dull and misty but still dry as we left on the well marked Hohenweg which traversed high across the steep north side of the Oberberg valley. 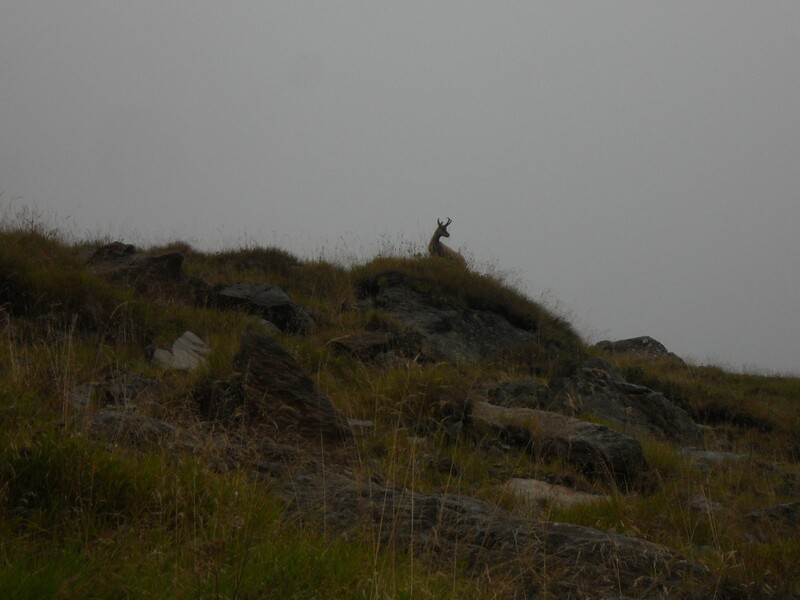 Chamois wee spotted high above us. In parts the path was narrow and shaly above long drops and cables were encountered several times so it took us longer than we thought to reach the small Hochseduckalm. 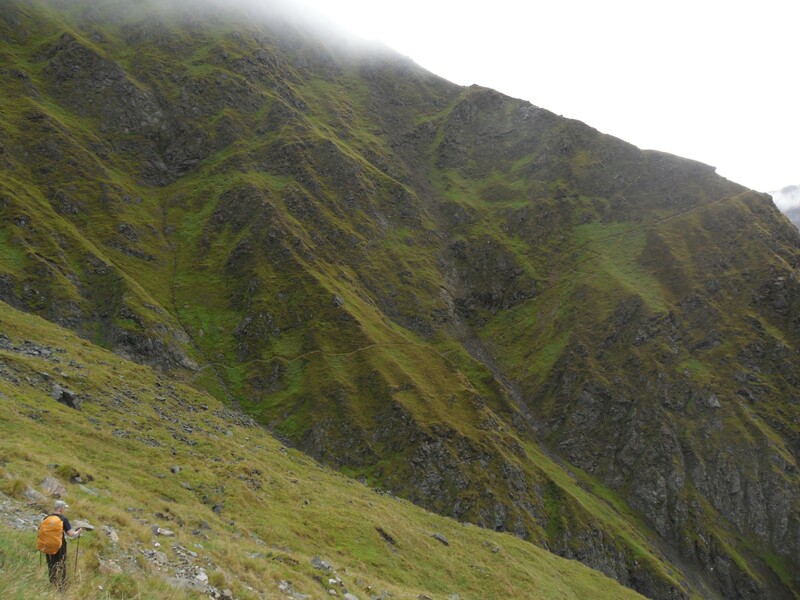 Spot the path – top right. 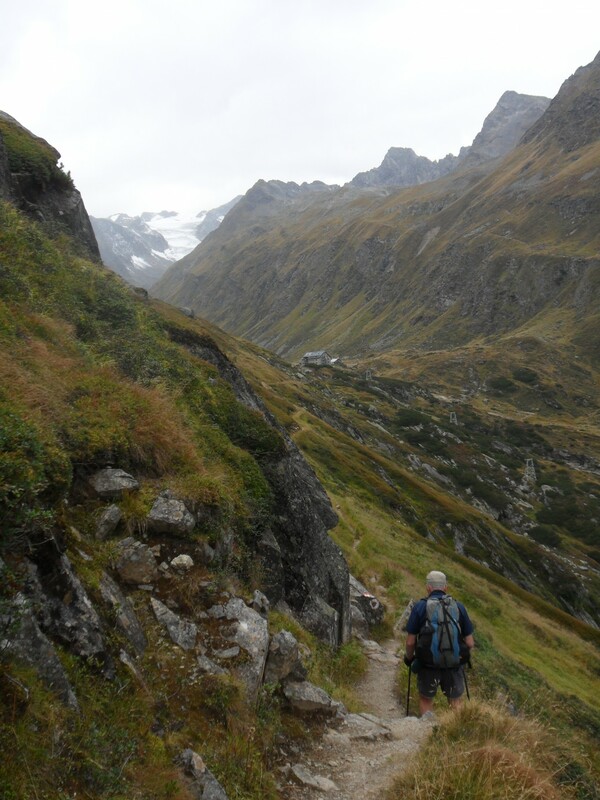 … and we tramped on down an impressive valley, the Potsdamer Hut only coming into view at the last minute. We soon dried out over ‘teewasser’ This was a great little hut with lots of character and a friendly warden. It was quite busy as it is on another hut -to-hut circuit of the Sellrain area. We plotted various routes for tomorrow dependent on the weather. 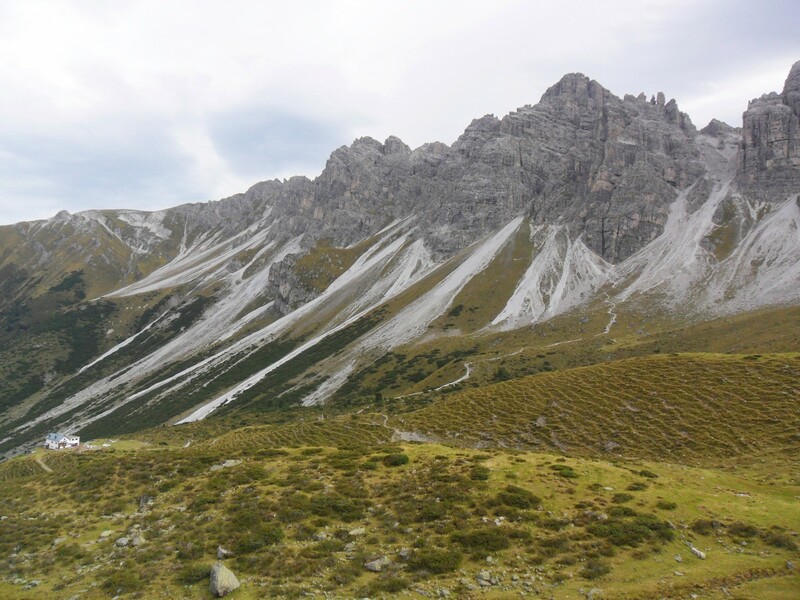 Stubaier Höhenweg VIII – the stony wastes. 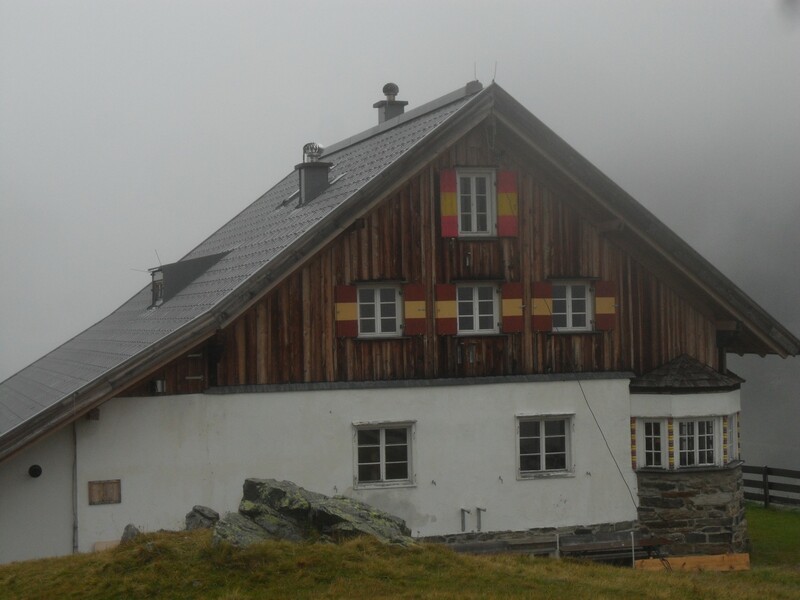 Neue Regensburger – Franz Senn Hut. A sea of stones en-route. Yet another bright sunny morning though Autumn has arrived and there is a heavy dew. 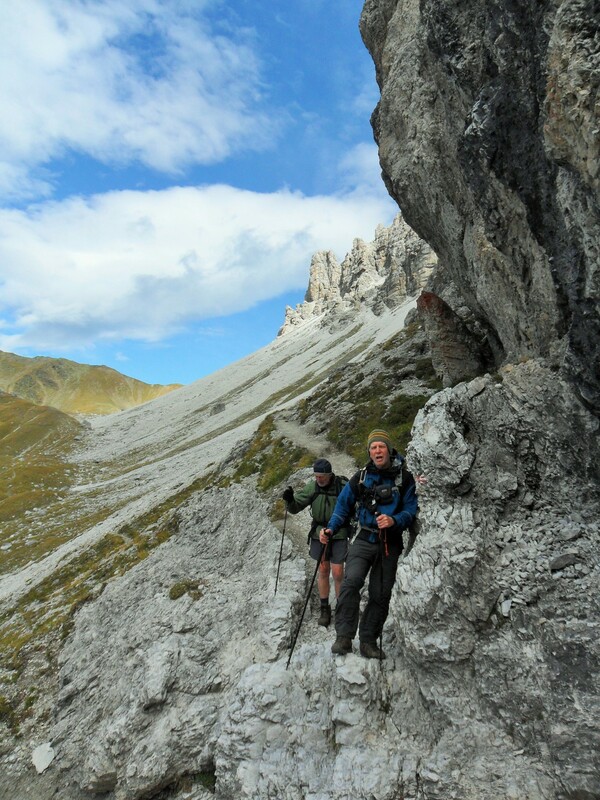 We were off on a short traverse across the hillside with great views back to the Resenburger. 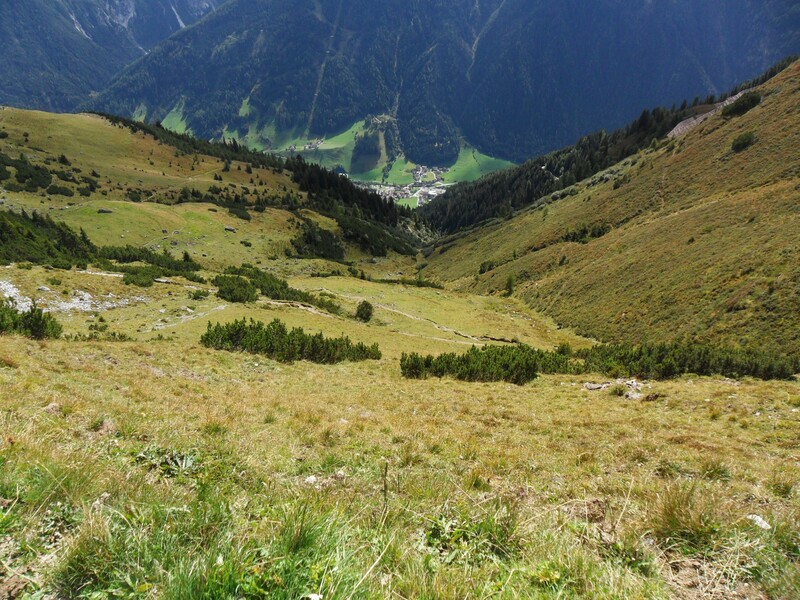 Then it was straight up to the Schrimmennieder pass at 2705m. All around were unstable stones and the path looped through them, I found the going tough and couldn’t sort my breathing. Two steps up one step down territory. 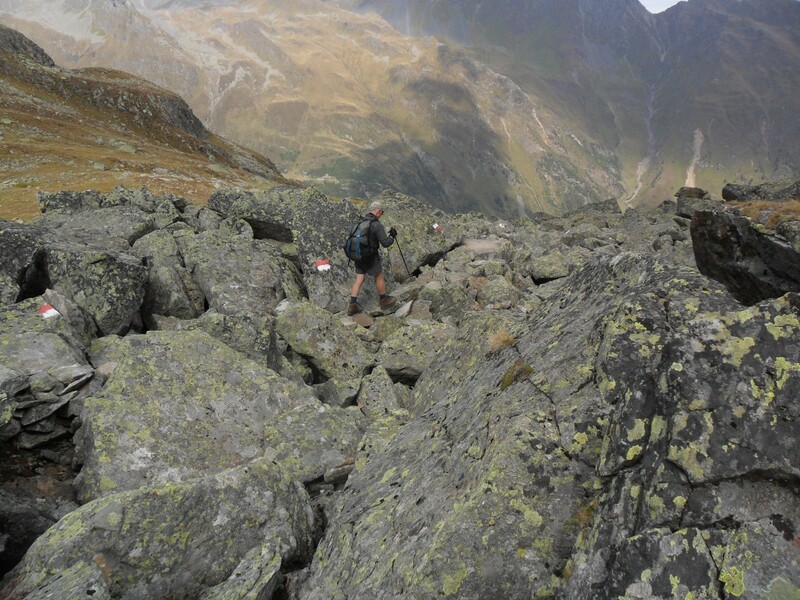 Arrived at the pass just as H and B set off to climb an adjacent summit, Besslerjoch. I left them to it and relaxed. Chatted to two German lads coming through, they had studied in Liverpool and we reminisced over some good scouse pubs. The way down the other side was extremely stony and hostile. Several areas have been devastated by avalanches and the route takes a circuitous line to avoid the worst, thankfully well marked with red and white. 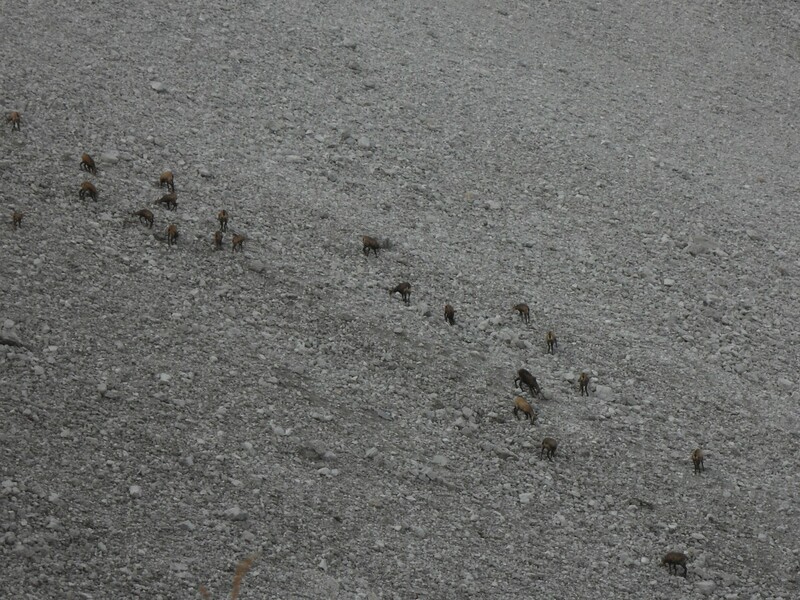 Even so it was endlessly hard going and one was very aware of the need not to slip or trip. 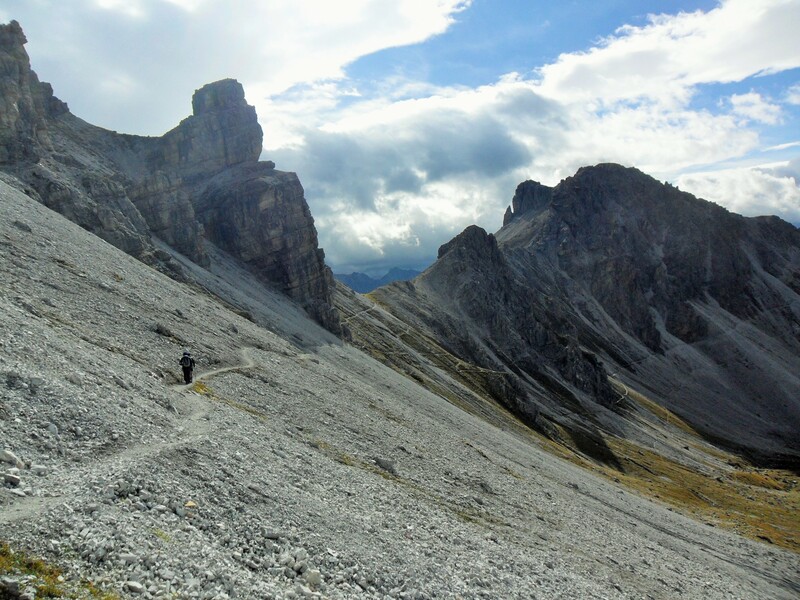 Even when we were out of the steepest sections the path traversing a large couloir went on for ever. The forecast had predicted rain and the day was darkening. Rounding a bluff the hut was in sight and we broke into a gentle trot to arrive before the rain hit us. 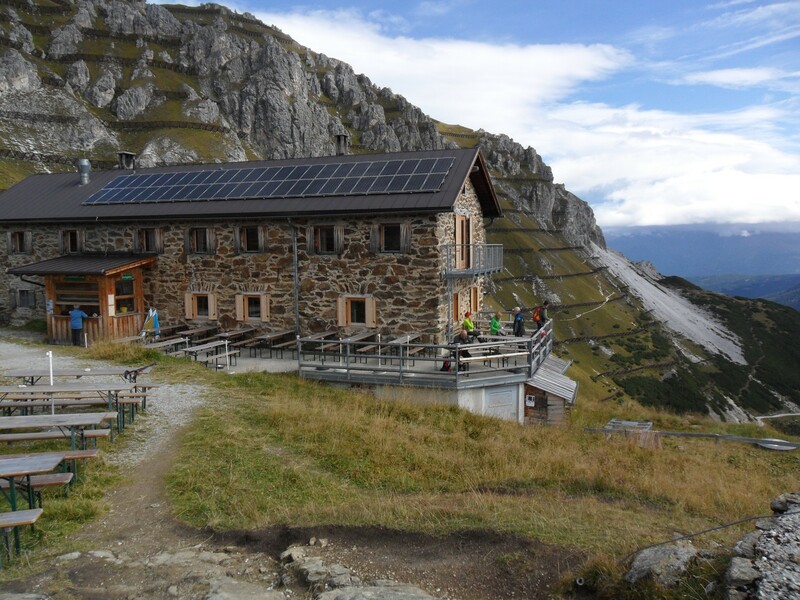 The Franz Senn Hut is massive and well equipped. 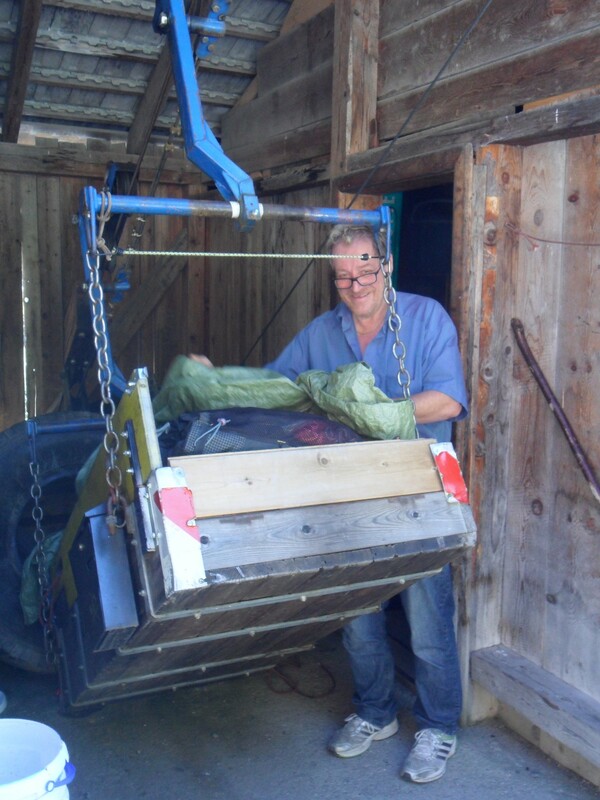 Strangely it was the first Austrian Alpine Club owned one we had used. A large restaurant was welcoming and we were booked into a room with Gunter who must have thought of us as strange English. 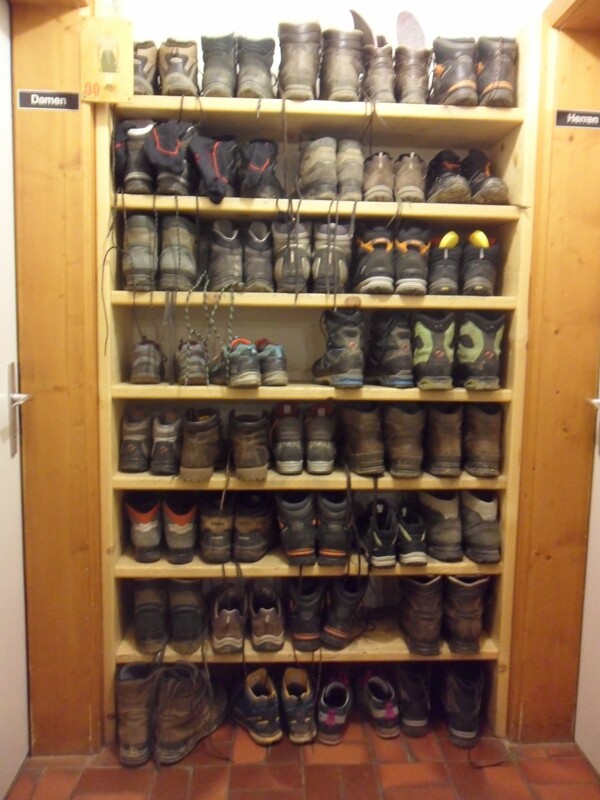 He was on an Alpine training course along with scores of others who filled the hut, the drying room was particularly busy as they came off the mountains with all their kit. Some colour in the stony wastes. 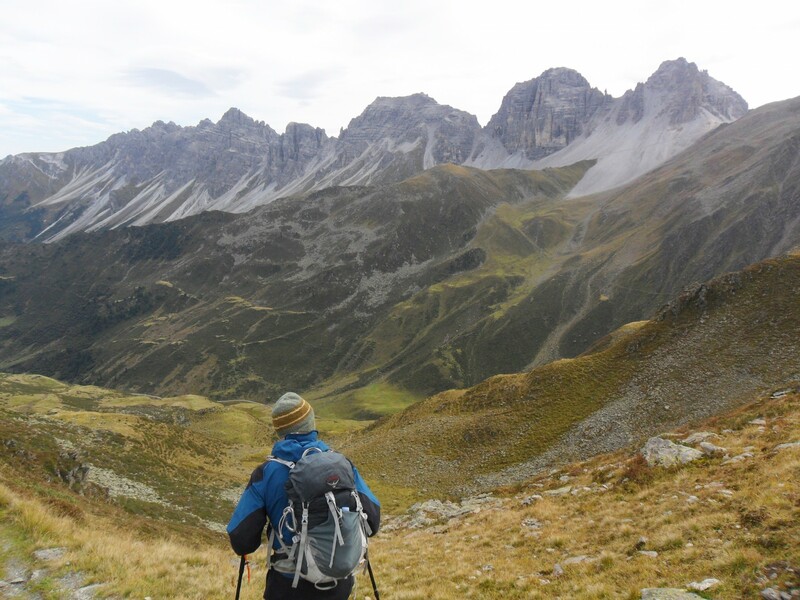 This entry was posted in Long Distance Walks., Stubai Rucksac Route., Walking. 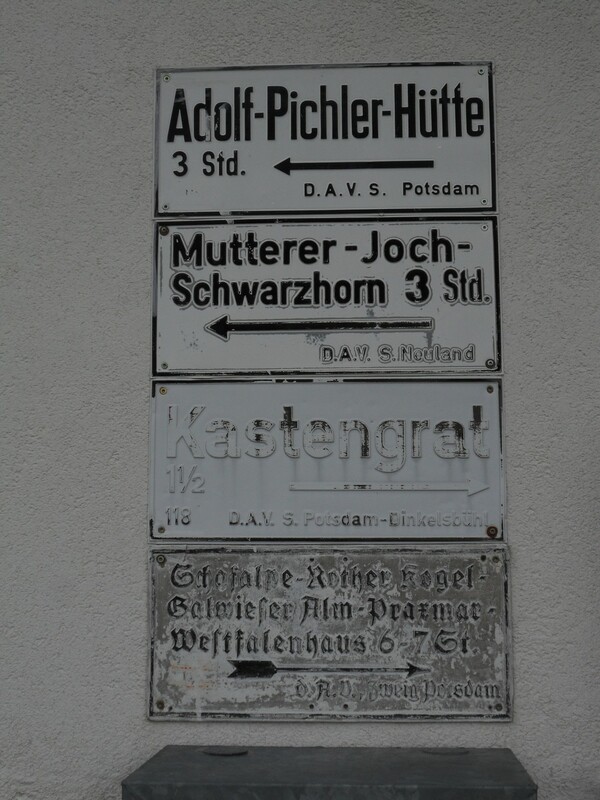 and tagged Austria, Long Distance Walks, Stubai, Walking. on September 24, 2015 by bowlandclimber. 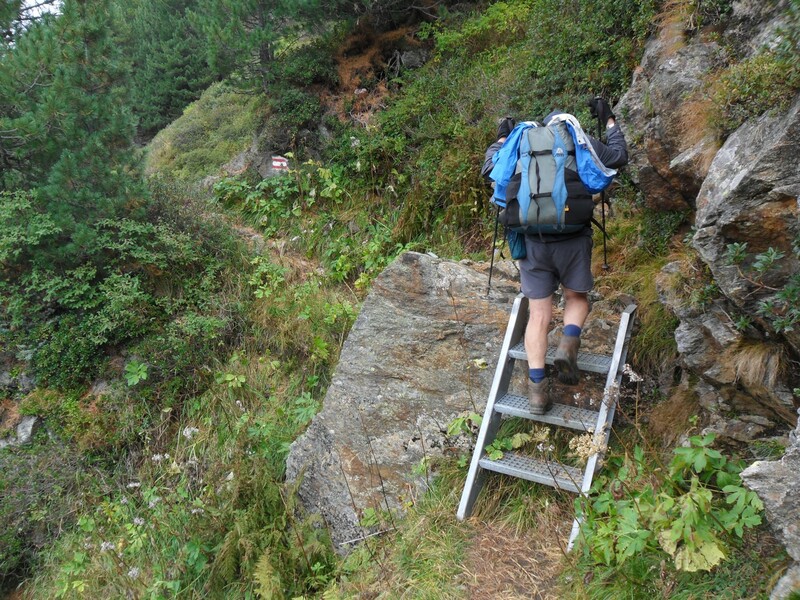 Stubaier Höhenweg VII – the easy way. 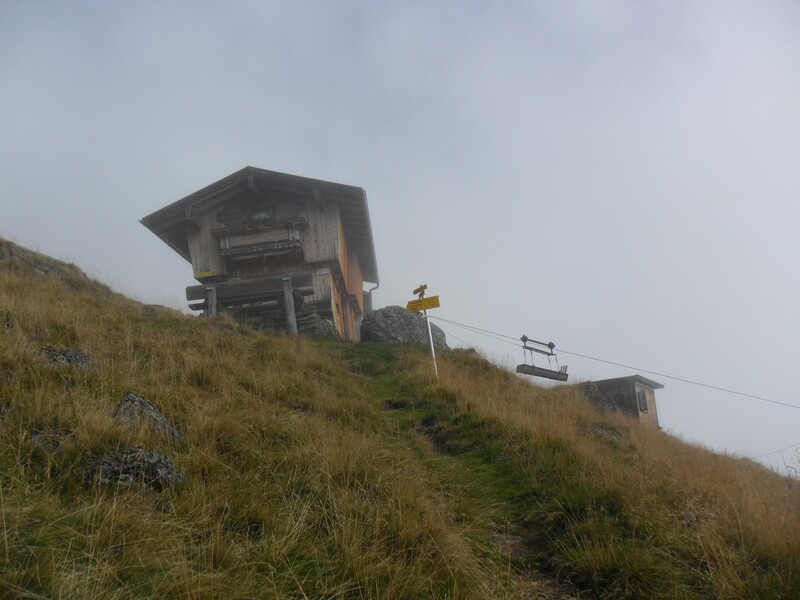 Up to the Neue Regensburger Hut. A quick down to start the day. There was no change of mind so we were whisked down the hill in the ski lift and onto the valley bus to be dropped at Falbeson. 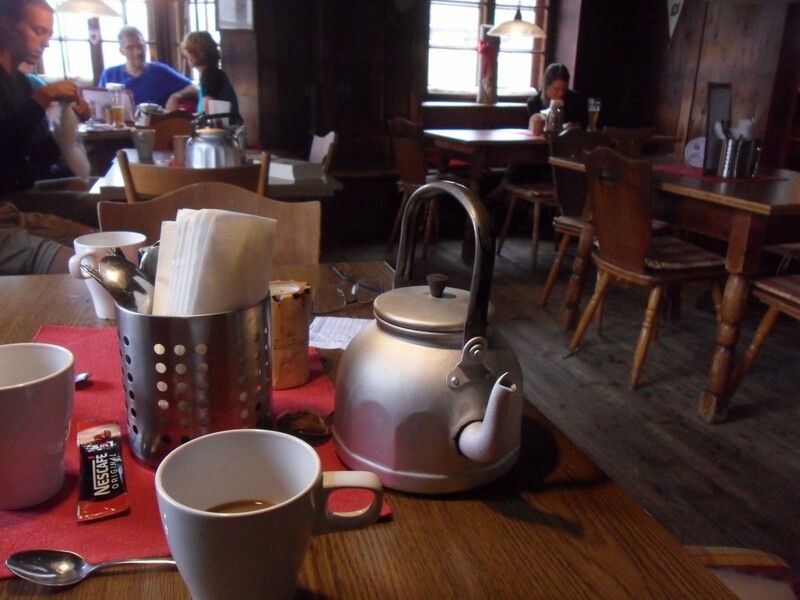 We went straight to the Waldcafe for a coffee and information on the luggage lift to the Regensburger. The owner was the cable supervisor at this lower end and arranged for us to send up our sacks. Whilst sorting mine I realised that my waterproofs were missing, a phone call to the Dresdner and they were found in our room!! How could I be so stupid. I was preparing to go back up for them when the barman said he could arrange for them to be sent down on the ski lift, popped on the bus to here and he would send them up. I was doubtful if this would work but he reassured me and sent us on our way, no load on my back but a heavy load in my heart worrying about the waterproofs. There was an initial steep zigzagging section up through the woods which just had to be taken steadily in the heat. Near the top I picked up a bright bandana meaning to leave it at the hut. 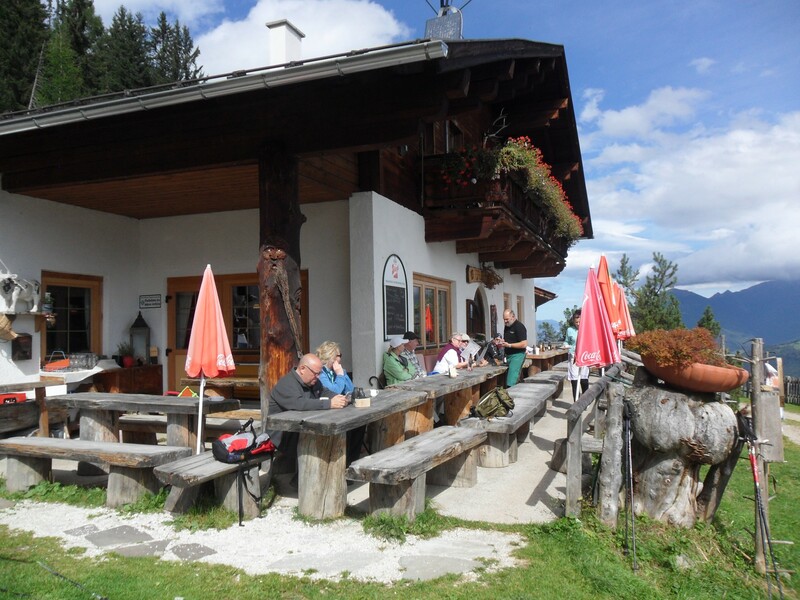 There were lots of day walkers using the track and stopping at a delightful cafe in an alp halfway up – we did the same and enjoyed a fresh elderflower drink. 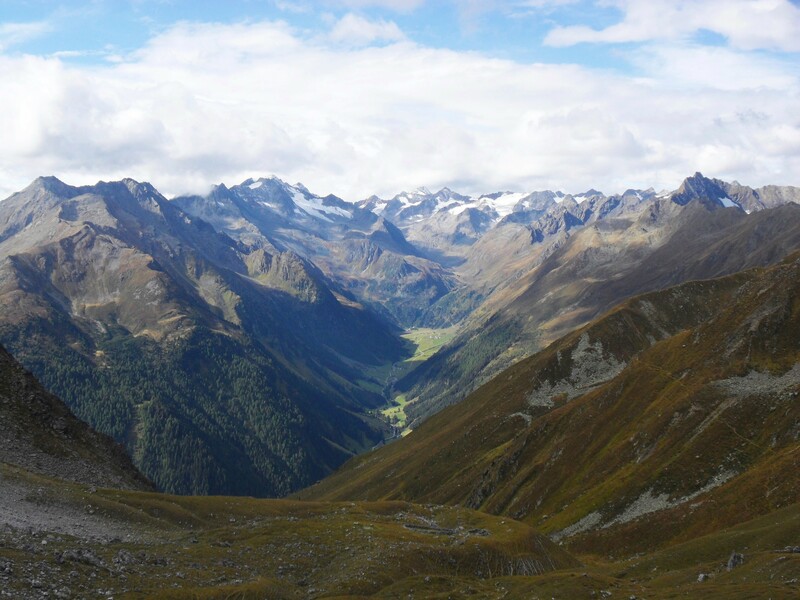 We had views down the valley to the prominent Habicht and up to the Regensburger hut. 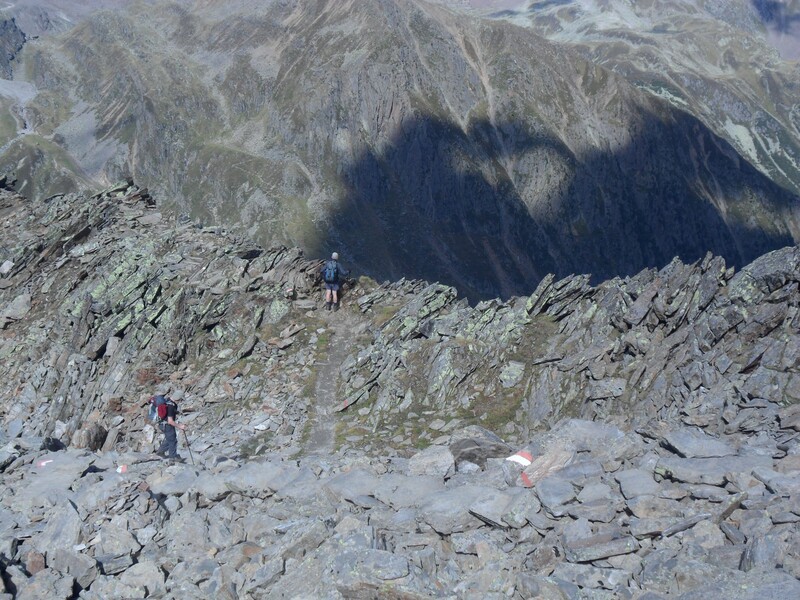 The route then started to climb again in earnest up to the Hut perched on the edge of the cliff. 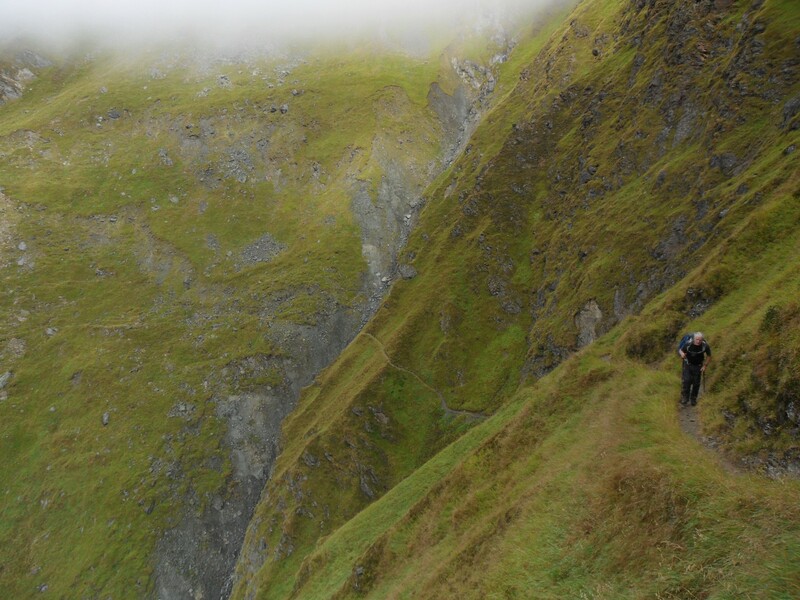 The luggage box wound its way on the cable above us with our rucksacks and hopefully my waterproofs. On the way down was an attractive lass who enquired if we had seen a bandana and when I produced it from my pocket I was rewarded with hugs and kisses – the day was improving! The hut was in a spectacular position on the edge and as the day was perfect the terrace was packed with diners and drinkers. Most went down to the valley later, though the hut remained busy with a lively crowd up for the weekend. Our sacks were there but no sign of my waterproofs yet, I thought the plan had backfired. 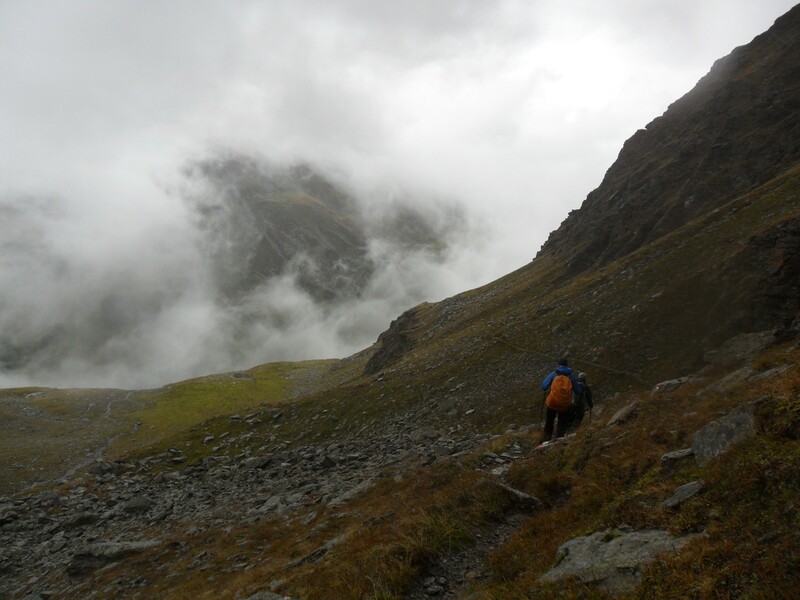 We strolled up the valley towards the infamous col but it was too far to make out the conditions. 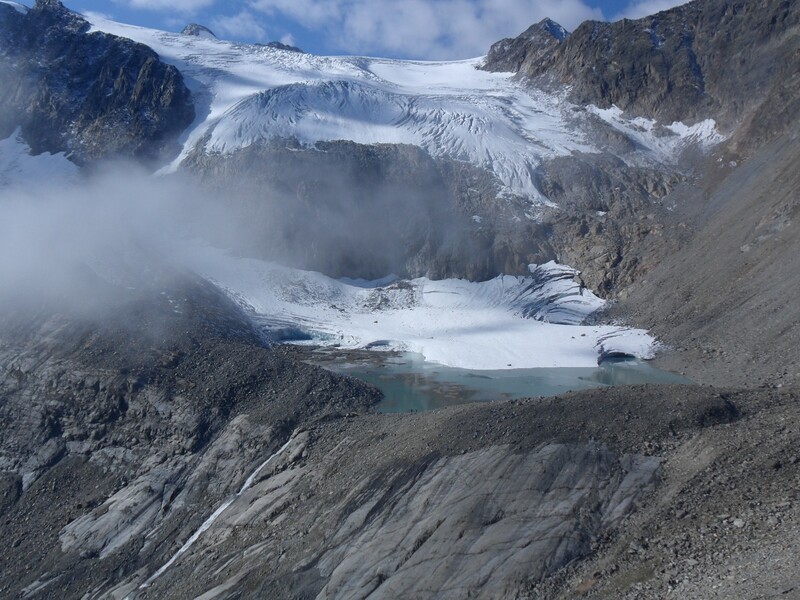 The valley itself had many roches moutonnées and a silted in glacial lake. As we arrived back at the hut another delivery was coming up and this time there were my waterproofs, a celebratory drink followed. Quite an eventful day. Thank you Waldcafe. 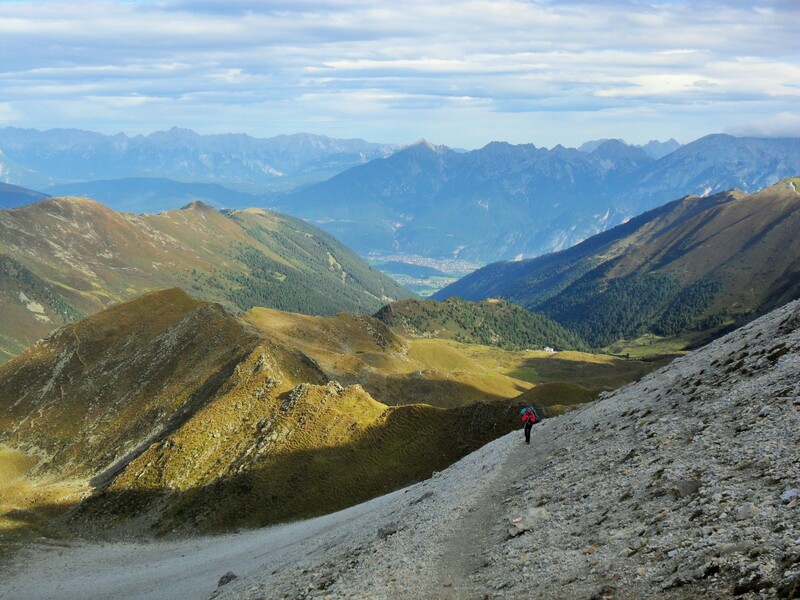 This entry was posted in Long Distance Walks., Stubai Rucksac Route., Walking. 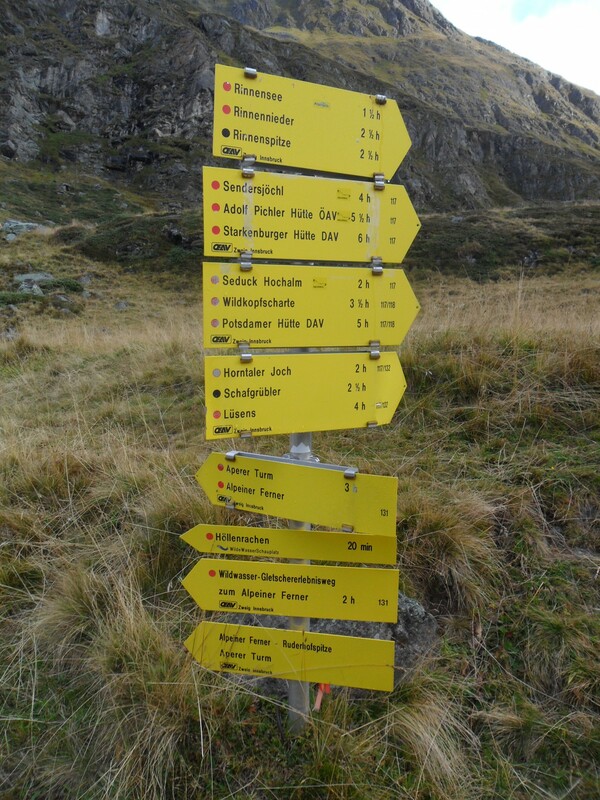 and tagged Austria, Long Distance Walks, Stubai, Walking. on September 23, 2015 by bowlandclimber. 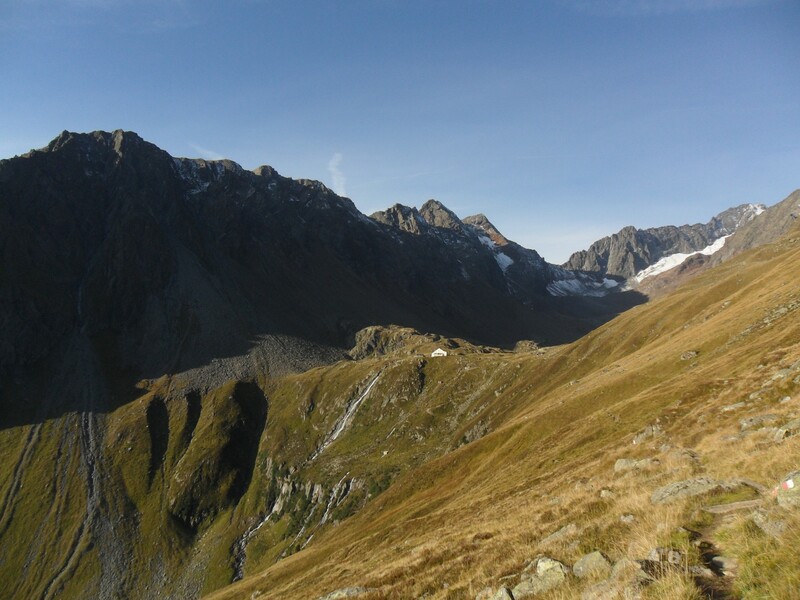 Stubaier Höhenweg VI – more and more moraine. Sulzenau Hut – Dresdner Hut. The breakfasts are getting better – muesli with yoghurt and boiled eggs as well as the usual bread and cheese. It seems to be normal to make a sandwich or two for the day ahead. We seem to be getting fitter and were up the valley in no time taking the higher route which crossed a rock buttress on unique metal planks. 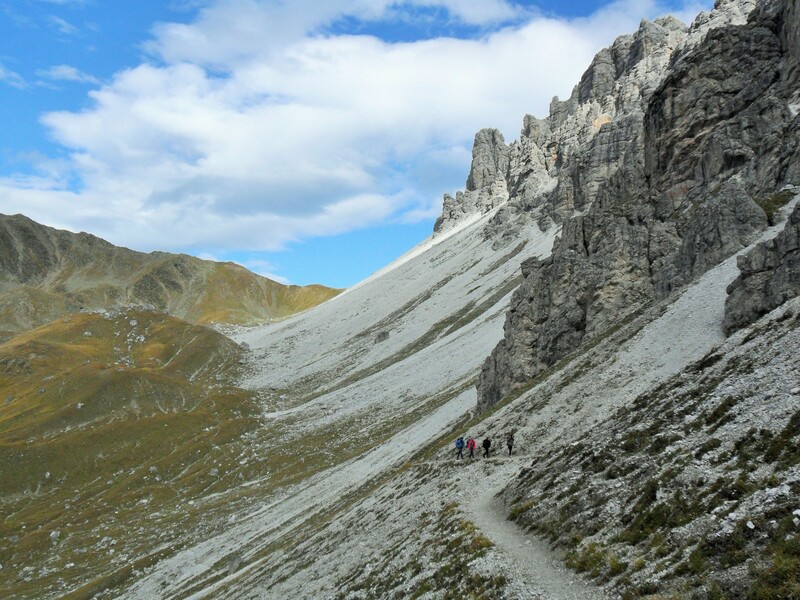 The path now followed the lateral moraine of the Sulzenau Ferner glacial system with close up views of the snout and lake. 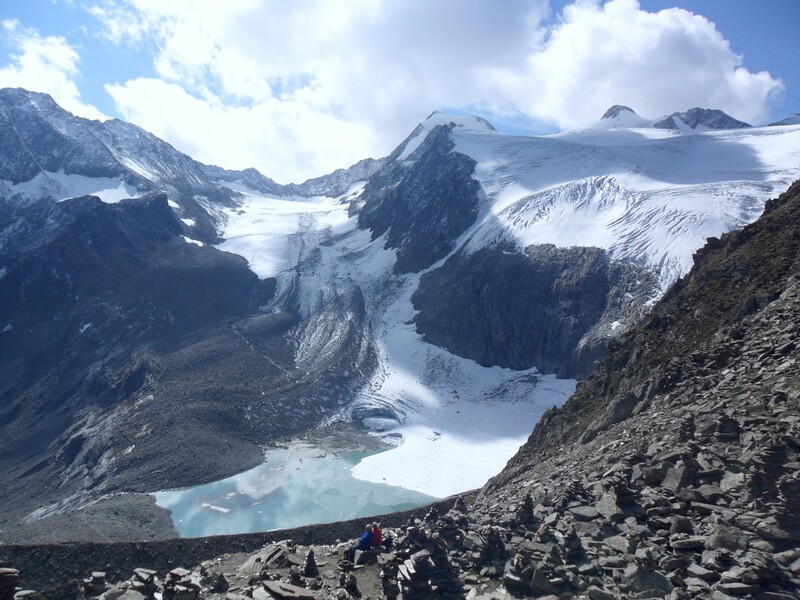 The mountain in the background is the 3500m Zuckerhuetl which the rockman had climbed aged 16yrs whilst on an Alpine Climbing Course he had enrolled himself onto. On the same trip his guide had fallen and broken his leg leaving the16yr old to help with a rescue – baptism of fire. 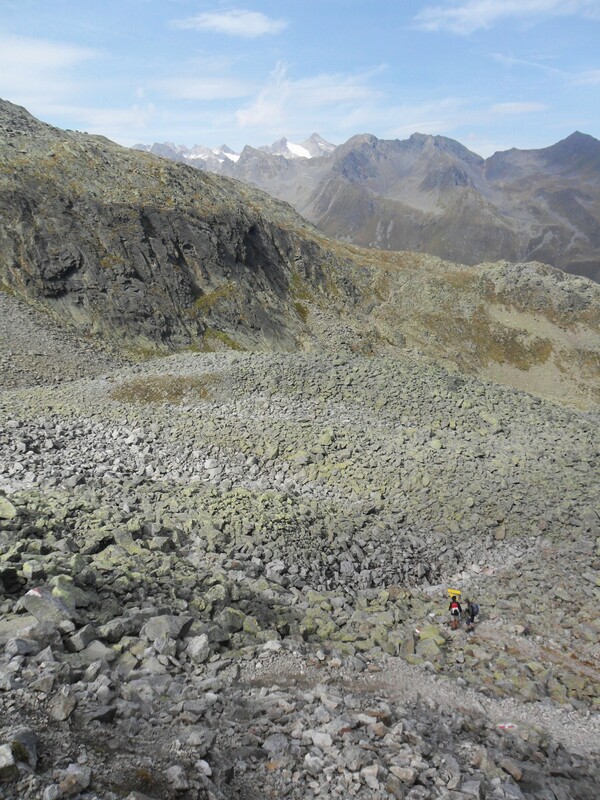 We trod carefully on the steep rocky slope leading to Peiljoch not wanting a repeat occurrence. 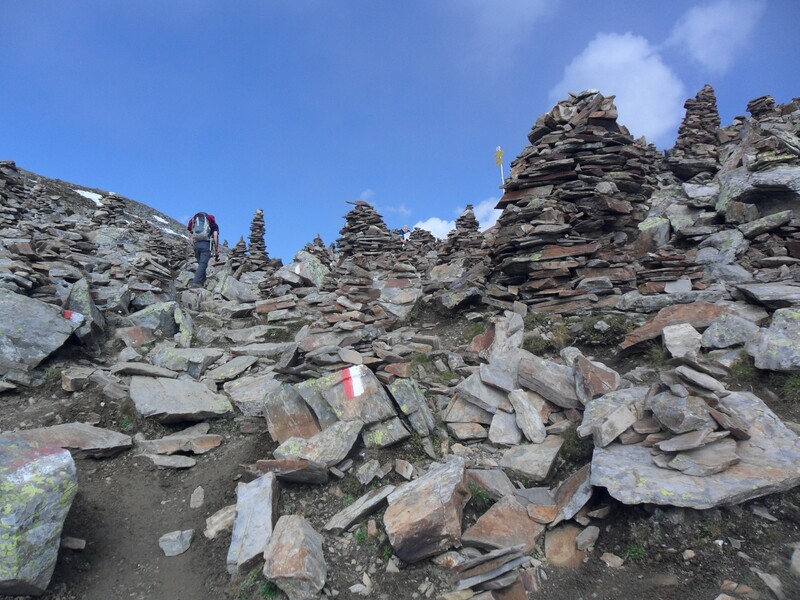 This col was a strange eerie place with a multitude of stone cairns more reminiscent of the Himalayas than Austria. There was no obvious reason for these apart from the abundance of flat stones. 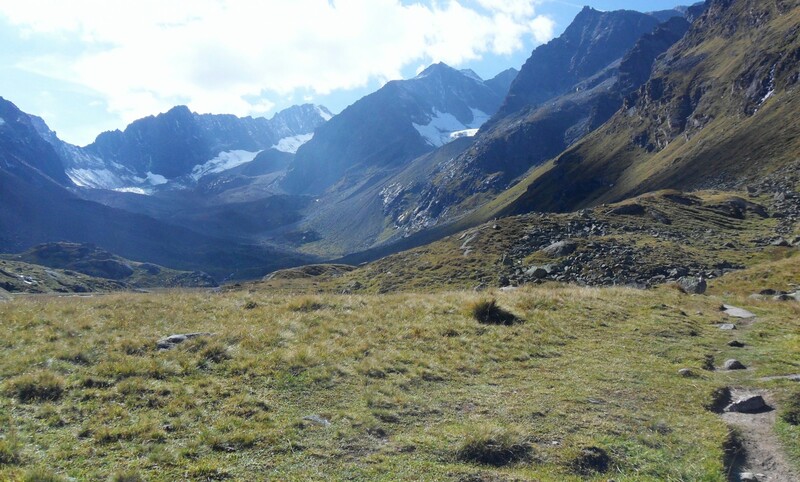 It was a nice place to sit around for awhile in the sun enjoying the views of the glaciers and onwards to the next hut in the vast Gamsgarten cirque with unfortunately all the associated ski and gondola construction work. Our way down all the stones was interesting, someone over the years has used them to ‘pave’ a path through the chaos. 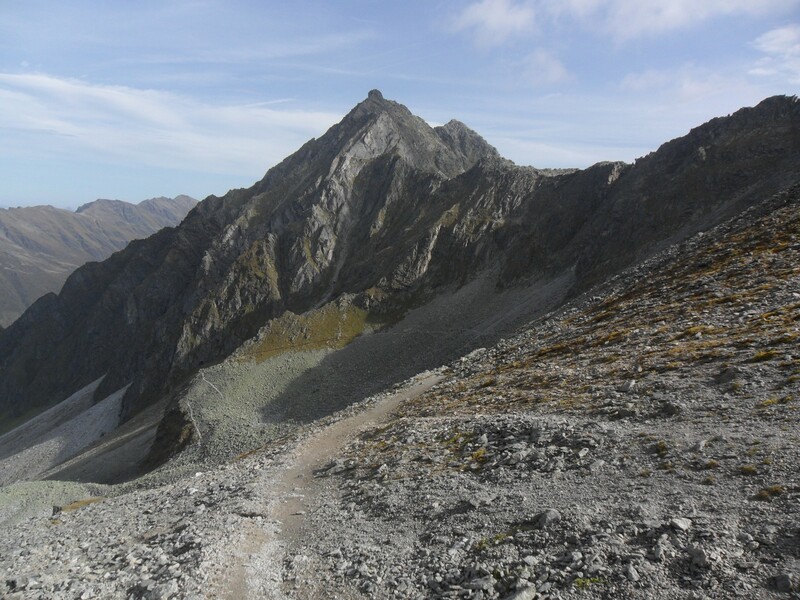 Eventually we walked along an airy rocky ridge with dramatic views down to the Dresdner Hut and then it was onto endless moraine debris again. 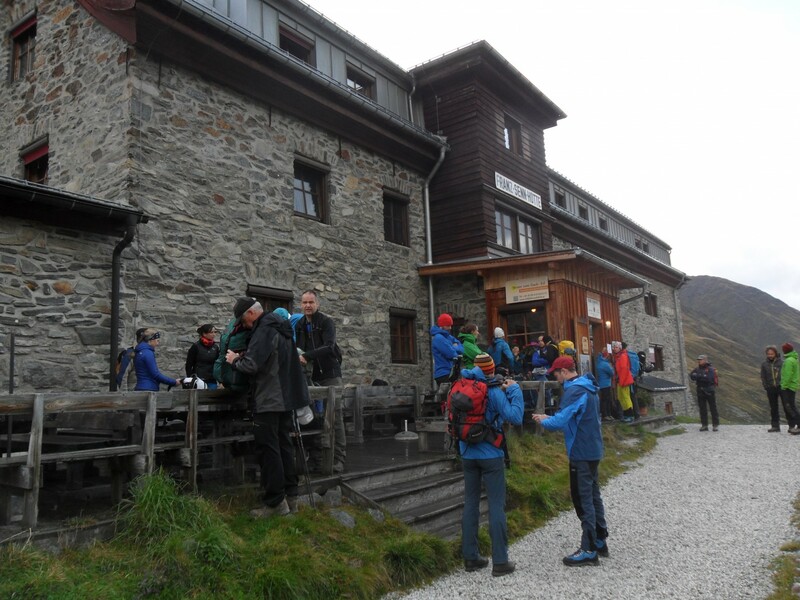 The Dresdner was a large modern building, more like a hotel than a hut and being adjacent to the gondola stations coming up from the valley and going to the top of the Stubaier Wildspitze was busy with day trippers. 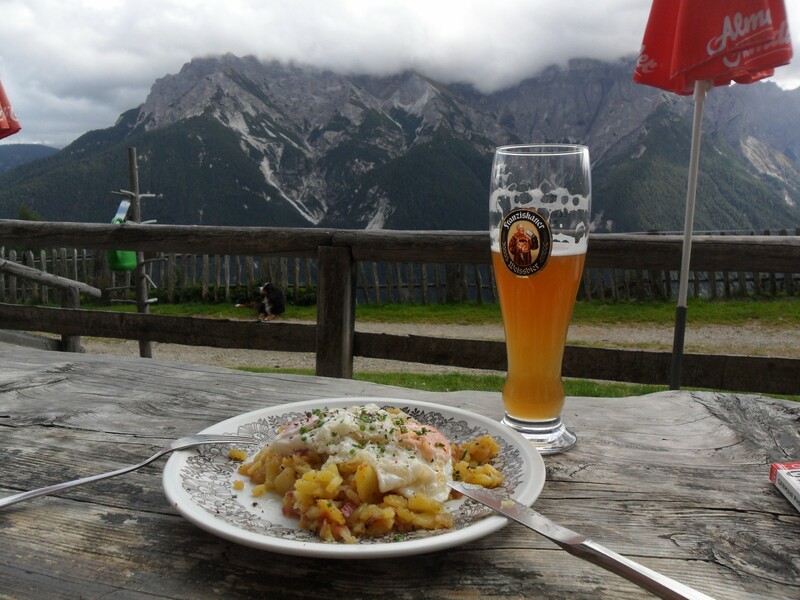 We considered a trip to the top but clouds were coming in so we just relaxed in the sun over soup and radlers. We were allotted a room already partly occupied with only the awkward top bunks free but playing the ‘bad back’ card managed to swap to a smaller room. Much cosier – we are getting soft. The restaurant was a large self service affair and we enjoyed yet another good filling meal. We met the only Brit we had encountered on the trip – a tough Glaswegian trekking with an oriental lady, an odd couple. Chatting to other walkers there was talk of a difficult high icy col and glacier crossing en-route to the next hut, Neue Regensburger. This was already going to be an 8 hour day with the potential problems well into the day with no easy retreat or return. Others were opting out and the hut warden thought it a very long hard day [looking us up and down!] so over a few beers we too came up with plan B. 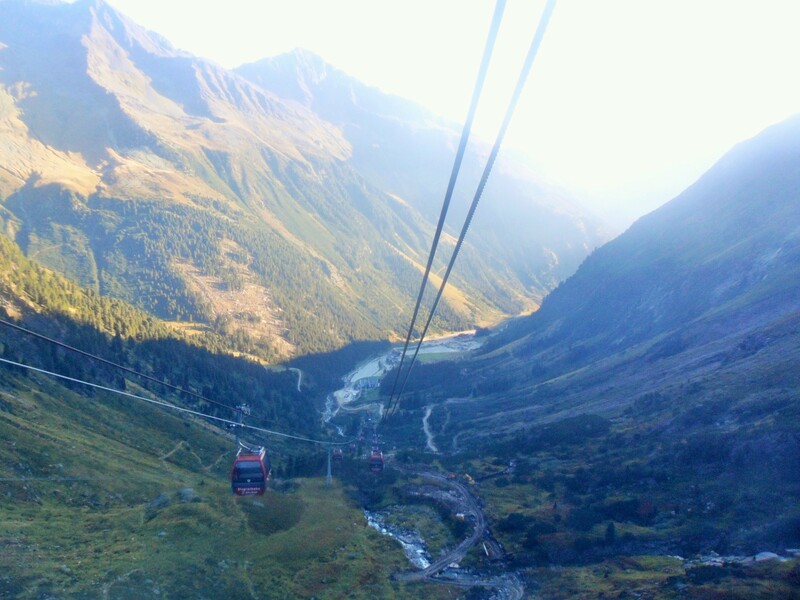 Simple really – go down on the cable car, catch a bus down the valley and then walk directly up to the hut.